Barbara Bush hated Donald Trump so much that she kept a 'countdown clock' in her bedroom, ticking off the seconds until he would leave office. 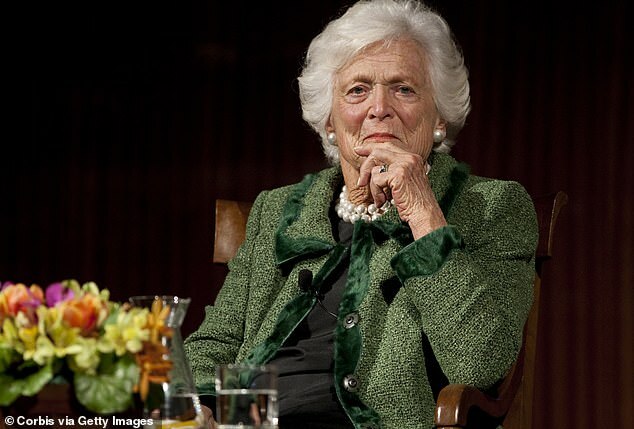 The former first lady died in April 2018 at the age of 92. Her husband, former President George H.W. Bush, passed away seven months later. She blamed the current president for a flare-up of her congenital cardiac condition, a moment she thought was a heart attack at the time, according to a forthcoming book by USA Today reporter Susan Page. And Mrs. Bush was so bothered by the brand of Republicanism Trump brought to the house where she once lived for four years that she had a hard time identifying with the GOP. She couldn't bring herself to vote for either Donald Trump or Hillary Clinton in 2016. She wrote in her son Jeb's name instead. And that countdown clock was by her bedside when she died. But ultimately, Mrs. Bush was hopeful that the U.S. would survive what she saw as a painfully disruptive episode that turned the presidency on its ear. 'I'm trying not to think about it,' she said, nearly a year after Trump took office. Page recalled her 2016 pronouncement after Trump ridiculed Jeb for deploying her to campaign for him during the New Hampshire Primary season.